The Cleveland Cavaliers won the NBA Draft Lottery for the third time in the last four years this past May, and now have many things to consider when thinking about what to do with the top pick in a deep draft. There are three prospects that have seemed to separate themselves from the rest of the pack: Joel Embiid, Andrew Wiggins, and Jabari Parker. These three are expected to go one, two and three in some order. While this may seem like a can’t lose situation the Cavs have struggled with their first round picks over the past few seasons. They hit when they selected the no-brainer top prospect Kyrie Irving back in 2011. Since that pick Cleveland has had some Cleveland-like luck. They selected Triston Thompson with the fourth overall pick in that same draft, and he is the best young guy they have even though they had another top overall pick since. The Cavs had the fourth pick again in 2012 and selected Dion Waiters, who was almost traded this past season. Cleveland could have had Damian Lillard in that draft who fell to Portland at 6, but they get a pass because they drafted their franchise point guard the year before. In a weaker draft it was the worst year for any team to win the lottery, but that’s Cleveland’s luck. Still Bennett clearly was not the best player in the 2013 draft, or at least not yet, and the Cavs wanted NBA-ready players and wanted to make the playoffs in order to attempt to attract LeBron James to come back home. 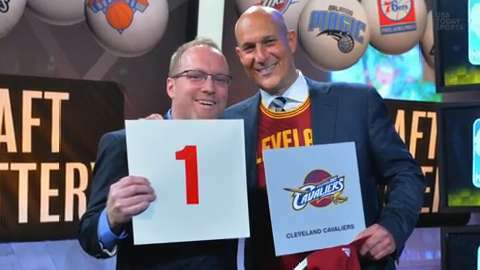 The playoffs did not happen and the Cavs found themselves back in the lottery of the 2014 draft with the ninth best odds of winning it. Cleveland landed the top pick once again, and now face big decisions this offseason as the impending free agency of LeBron draws another year closer. Here, in order, are the best moves the Cavs can make with the first pick in the 2014 NBA Draft. There is an asterisk next to this one because the Cavs should only do this trade if Kevin Love agrees to sign a long term extension with the Cavaliers. The goal of the Cavs is still to get a playoff team on the court and Love paired with Irving is a great start. This option also leaves room for LeBron to come back home and join another Big 3. Everything Cleveland does this offseason should be of the mindset to make the team good enough that LeBron would want to come back. Now this doesn’t mean drafting Embiid, Wiggins or Parker doesn’t make you better, but LeBron wants to compete for championships and Kevin Love helps him do that. Nick Borges of ESPN.com reported that this deal could be offered from the Sixers and if this trade comes across Dan Gilbert’s desk he should look long and hard at it. Young is a good young talent who wants out of Philly anyway and wants to win. He can terminate his contract after next season, so the Cavs would once again want to have some insurance that Young would stay in Cleveland after 2015. Let’s not forget the Cavaliers still get whichever of the top three prospects fall to them at the third pick. The Sixers would move up to get Wiggins at No. 1, who is right now the player atop their big board. This trade also then makes the decision easier for the Cavs who then cannot get blamed for taking the wrong player as they did the year before. And this isn’t that bad of a third option. As I said earlier the Cavs get their choice of the three top prospects in this year’s draft: Embiid, Wiggins or Parker. All of the mock drafts, including ESPN’s Chad Ford’s Mock Draft 7.0, have Cleveland taking center Joel Embiid if they select from the No. 1 slot. Back injuries are the one concern surrounding Embiid and the Cavs do not want to wait on another prospect to develop. Embiid is the least NBA-ready, but could very well be the best player taken in this draft five years from now. I believe if the Cavs pick a player first overall it will be Wiggins who can make an impact immediately and help get Cleveland back into the playoffs with or without LeBron James in 2015. This entry was posted in Draft / Offseason, Home, NBA and tagged 2014 NBA Draft, Andrew Wiggins, Anthony Bennett, Bill Simmons, Cavs, Chad Ford, Cleveland, Cleveland Cavaliers, Jabari Parker, Joel Embiid, Kevin Love, Kyrie Irving, LeBron James, Mock Draft 7.0, NBA Draft Lottery, No. 1 Pick. Bookmark the permalink.